It is an insignificant action that almost cost him his life. On April 27, 2004, Paul François, a French farmer, takes a look at the bottom of a tank containing a weed killer. 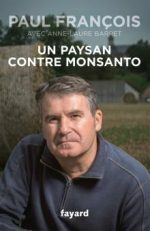 Severely intoxicated by the vapors of Lasso, an herbicide from Monsanto still authorized in France at the time, the cereal grower spends several days in a coma and almost a year in hospital. On September 10, 2015, after more than ten years of struggle, the Court of Appeal of Lyon recognized the responsibility of the multinational Monsanto. But this historic condemnation, confirming the one that had already been pronounced in 2012, did not mark the end of his exhausting judicial marathon. In July 2017, the Court of Cassation cancels the Lyon judgment and refers the case back to another Court of Appeal. As he embarks on this new battle, Paul François takes up the pen to reveal the behind the scenes activities of his terrible fight against the American multinational corporation. Denial of the serious damage caused by the product, attempts at destabilization, the violent nature of the arguments of the opposing camp, Paul François gives us a breathless account of a fight with unequal weapons. Paul François, a French cereal farmer, is president of the Phyto-Victims association. He was a witness at the International Monsanto Tribunal in The Hague (Netherlands) in October 2016. He is a member of the Board of Directors of Justice Pesticides. The book was published on October 25, 2017, at Fayard eds.